Motola, like so many who must share their lives with former war zones and forgotten minefields, lost a limb in 1999. Thankfully, she walked again today courtesy modern medicine and an artificial limb. The thing is, she's an elephant. And, as an elephant, she weighs three tons. That kind of weight—excuse me for saying so, ma'am—requires one strong prosthesis. It took a few years of work to get right. 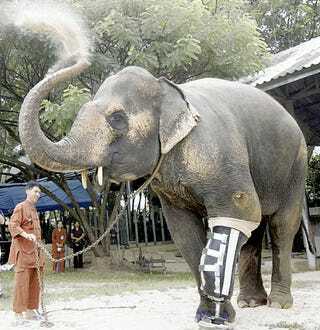 In the interim, Motola was forced to use a temporary prosthesis. This was completely unbecoming of her status as a respected 48-year-old pachyderm. But she was patient, and today she took her first steps. They were a success. To celebrate the occasion, Motola sucked up some dirt and blew it skyward like dusty fireworks. She has some work to do, but the limb held her massive frame, and she'll hopefully be walking with some semblance of normalcy for the rest of her days.